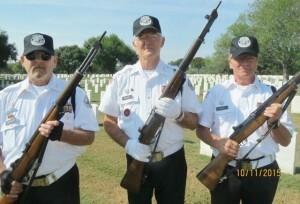 Three former Chaplain Assistants who retired at the rank of Sergeant Major are still serving our veterans at Fort Sam Houston National Cemetery in San Antonio, Texas. 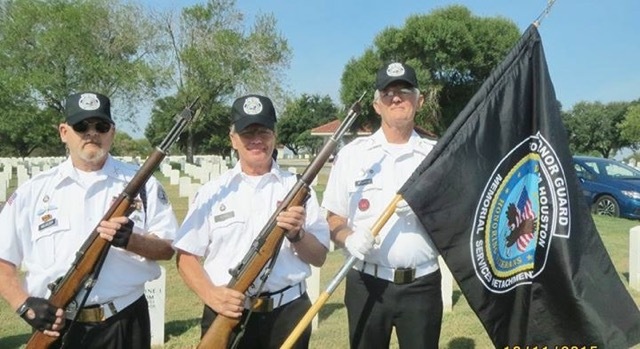 Sergeants Major Retired, David Klass, Bill Neuiszer and Ron Bowren all live in San Antonio, Texas and volunteer one day a week at the Fort Sam Houston National Cemetery. 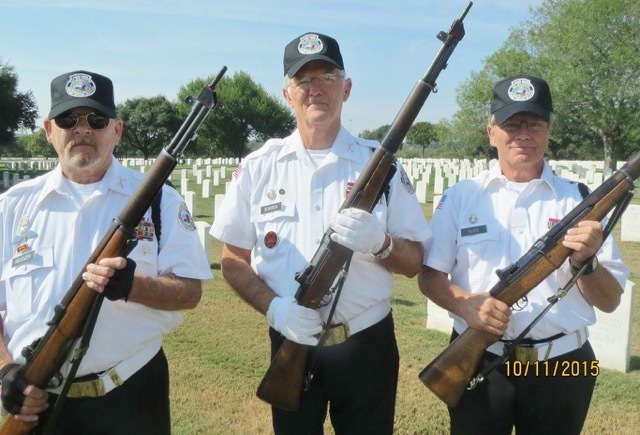 They serve with the Military Service Detachment Honors Team as a rifleman, which renders military honors to veterans of all branches of service. Two active duty service members begin the service by holding the U.S. Flag over the casket while members of the Detachment fire three volleys of rifle fire and play taps. After taps, the flag is presented to the next of kin family member and the honors team renders present arms. A different team of volunteers serve each day of the week. David Klass retired in 1993 from Tradoc Headquarters, Fort Monroe, VA.
Ron Bowren retired in 1994 from USARPAC Headquarters in Hawii. Bill Neuiszer retired in 2000 from 18th ABN Corps, Fort Bragg, NC. Each on of these NCO’s also serve on the San Antonio Local Chapter Committee of the U.S. Army Chaplain Corps Regimental Association. Are you ready to mark your calendars? Excitement is building as the planning moves forward for the next United States Army Chaplaincy Corps Regimental Association (USACCRA) 2016 Reunion! The dates are set, the city is selected, and the hotel is contracted. San Antonio is a bustling, historical city. Although San Antonio is the 7th largest city in the nation with the population of 1.4 million, it is known as “a large city that feels like a small town.” It dates back to the May 1st, 1718 when Franciscan missionaries and the Spanish crown established the first mission along the San Antonio River. The mission was called Mission San Antonio de Valero. Five other missions followed. That first mission later became known as The Alamo. The Alamo is number one on every visitor’s list; three to four million visitors from all over the world walk through its doors each year. Not only historically significant, the city is a modern metropolis which offers unimaginable opportunities for millions of visitors each year. Following close behind The Alamo is the famous River Walk. The River Walk originally began as a result of a plan to protect down town San Antonio from flooding. Now it is a 15 mile long city park which draws visitors from everywhere across the world. On July 5 of this year, the five missions in San Antonio were in scripted as a UNESCO World Heritage site. It is the only World Heritage site in Texas and the 23rd in the United States. This designation has increased exponentially the number of international visitors to San Antonio. As you can tell, the local USACCRA group is excited to host the 2016 Reunion. As we grow closer to the date, we will introduce you to more and more details of our planning. After the first of the year we will provide you with the link to make your hotel reservations and register for the Reunion. In the meantime, review the attached link and begin getting excited with us! Begin by blocking 26-29 October your calendar. We look forward to welcoming you to San Antonio! San Bernardino – Some of you may know one of the community pastors in San Bernardino is recently retired Army Chaplain (Colonel) Scottie Lloyd. Scottie and Karen moved from Washington DC to accept a Call as Pastor at Lutheran Church of Our Savior, San Bernardino, California. In the midst of the horror and pain of the mass killings in San Bernardino this Wednesday, it is not surprising that former chaplain Scottie is at the forefront (lead quote in the article) of getting clergy together to pray, console, support and stand in solidarity for peace, justice, hope and healing. Another colleague, Chaplain Mike Lembke, now at US Southern Command, Miami, expressed it beautifully in a note to me, “For many faithful this is a season of Light (Advent and Chanukah) and this article is a testimony to the power of light to overcome darkness. “ As you light candles for Advent, for Sunday worship, or for quiet meditation, prayer or a meal during this season with sunset coming quite early, take comfort in Mike’s reminder and pray for Scottie’s ministry. As a new chaplain Captain on active duty my first year was uphill learning until I met a man who passed a torch to me with the key advice I needed to order my learning. It was 1987 and three Lutheran church bodies were merging into one group called the Evangelical Lutheran Church in America. One of those church bodies, the American Lutheran Church, decided to gather all of their military chaplains together for one last hurrah before this new church birthed. My friend continued. “They have me in with some old guy. Who are you with?” I replied in total ignorance, “I’m rooming with an old guy named Connie Walker.” For many this reply will elicit laughter. Chaplain (Colonel) Connie Walker was a living legend, but a junior chaplain like me had no idea. That night I met Connie and we shared and prayed together. It was a ministry changer. That moment of mentorship set me on a correct course on being a dedicated chaplain. I never called Connie old again. I promised him that if I became a senior chaplain I would mentor others as well. One way I keep that promise is by mentoring a chaplain currently serving on active duty through the USACCRA-sponsored mentorship program. It’s a great way to be matched with a younger colleague to help pass on the torch of ministry in the Army. It is one of the reasons why I enjoy being a part of USACCRA, it’s not just for “old chaplains”, but a connection of past and present for a better future. It’s another way to serve God and country.